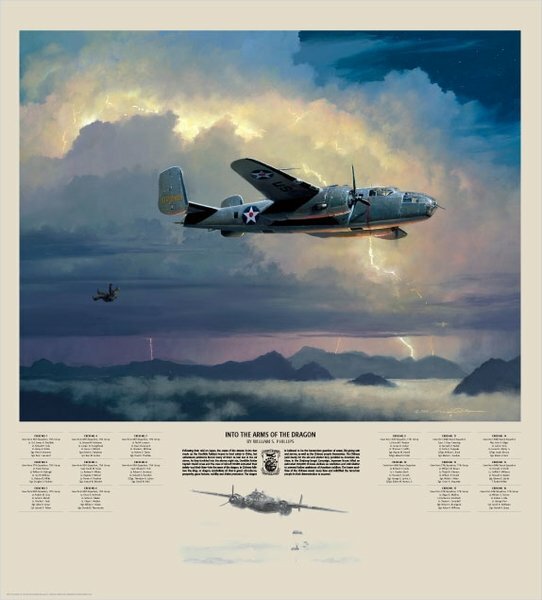 Image size: 25"w x 19 1/2"h.
The Doolittle Raid on Japan was always designed as a one way mission: from the carrier to friendly airfields in China by way of Tokyo. Because of the early discovery by Japanese picket boats, Captain David Jones and the rest of Crew 5 (aircraft 02283) left the deck of the USS "Hornet" knowing their one-way trip was perilously shorter. They knew that their B-25 did not have the range to make those friendly airfields, and getting to the China coast or past Japanese-occupied China would take great skill and uncommon luck. At a small break in the cloud cover over Chu Chow the members of Crew 5, who could coax their aircraft no further, left the plane, trusting their parachutes, the wind and the Chinese people to lead them to safety. In Chinese folklore the lóng, or dragon, symbolizes all that is good: abundance, prosperity, good fortune, nobility and divine protection, as well as the Chinese people themselves. The dragon is believed to be the benevolent guardian of water, as well as life-giving rain and storms. As they tumbled into the stormy night sky, David Jones and his crew entrusted their safety —and their lives — to the arms of the dragon. The Chinese paid dearly for the aid and shelter they provided to American soldiers. In the Zhejiang-Jiangxi Campaign, Japanese forces killed an estimated 250,000 Chinese civilians as retaliation and intimidation to prevent further assistance of American soldiers. The brave sacrifices of the Chinese saved many lives and solidified the American people in their determination to succeed. William S. Phillips inspiring limited edition "Into the Arms of the Dragon" pays tribute to the combined efforts of two nations. Countersigners: MSgt. Edwin Horton, Jr., Col. William M. Bower, S/Sgt. David J. Thatcher, Col. Richard E. Cole, Maj. Thomas Griffin and Col. Robert Hite.